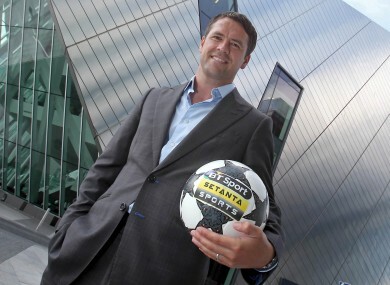 Owen at yesterday's Setanta Sports / BT Sport announcement in Dublin. MICHAEL OWEN HOPES to follow the example of old sparring partner Gary Neville when he makes his own move into the world of football punditry next season. Though international team-mates with England, Owen and Neville frequently found themselves on opposite sides during the heyday of their playing careers. Since hanging up his boots, Neville has made a name for himself as one of TV’s rising stars and has been lauded as a breath of fresh air for his insightful analysis on Sky’s Monday Night Football. Now Owen is getting ready to join him on the other side of the camera and starts his new role as a co-commentator when BT Sport launches later this summer. The new channels, which will be available in Ireland as part of the Setanta Sports package, have the rights to 33 Premier League matches including 18 “top pick” games, giving the former Liverpool striker plenty to talk about. And he says there’s no better role model for him starting out than Neville. “He’s relevant, he’s just finished football and he’s taken to it like a duck to water,” Owen said at yesterday’s announcement in Dublin. I can watch him and enjoy what he says, relate to it, understand it, and I think he puts it over in a good way. I’d like to obviously not copy him, but I’d like people to talk about me in the coming months and years and say he’s taken to it well, I can understand what he’s saying, he points it out and gives us valuable insight. Before his first game in the gantry, Owen will have some pre-season training sessions with BT. Already, he knows that he will have to bring an extra element to the game for the viewers. I’ve spoken to loads of commentators and co-commentators, just sought their advice, and the one thing that everyone seems to keep coming back on is not saying the bland things that everyone can see, getting over that insight, putting it into the right words and being able to say it quick. The move marks a new departure for Owen who, at the age of 33, announced his retirement at the end of last season. Although he has some coaching badges under his belt, the former European Footballer of the Year admits that management wasn’t really an attractive option. “You could go down the management route but that really rules your life, there’s no days off or anything like that and having played for 16 years solid, I just didn’t fancy that as we speak. Email “Owen hopes to follow example of punditry poster-boy Neville”. Feedback on “Owen hopes to follow example of punditry poster-boy Neville”.